If you visit Madrid, there is no excuse for not trying one of those classic bocatas de calamares. Let’s say that it’s like going to New York and not trying the bagel. There is a whole world behind this simple sandwich, which can be eaten at breakfast at dinner or at any time during the day. Even though squids come from the sea, this article will convince you that the Spanish capital is the best place to get the real taste of this manjar. Casa María is a modern bar based in Plaza Mayor. Visited by locals, bocadillos de calamares cost here 2,90 euros. In addition to this delicatessen, don´t hesitate to try the delicious French omelette which comes with chistorra, a fast-cure sausage typical from the North of Spain. It opened its doors in 1952 and it’s very close to Atocha station and the Reina Sofia Museum. This is the best place to stop before catching the train. El Brillante offers a wide list of types of bread and bocadillos, which are around 6,00 euros- There is no doubt that they are worth it! Bar Potas is one of those old Spanish bars where you can find a metallic counter, which is always busy. Don’t waste your energy by searching for chairs and instead get the menu and order one of the delicious sandwiches. Here, the combination of tapa & caña only costs 4,80 euros. Based very close to Plaza Mayor, La Ideal is a very convenient option to visit whilst exploring the classic “Madrid de los Austrias”. Its fresh bread will encourage you to stay there for hours. If you are still hungry, you can always try the Spanish omelette or the delicious bravas. Los Galayos is a great choice whether you fancy a quick tapa by the bar or a proper meal in the dining area. This bar-restaurant is based in Plaza Mayor so don’t be surprised if you are not able to find a table outside. In the meantime, don’t hesitate to enjoy a glass of Rioja at the bar. Some people refer to El Respiro like the place to go in case El Tigre (another famous local bar in Madrid) is busy. This bar is as generous as El Tigre and this means that tapas and raciones here are huge. 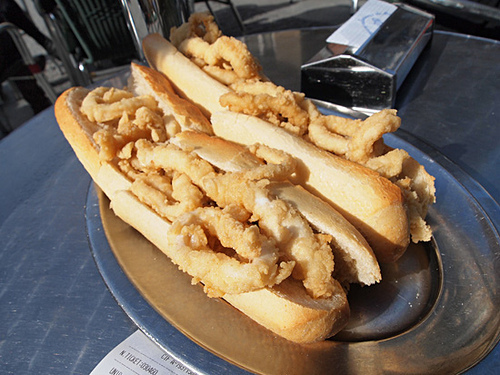 The variety of snacks available is amazing but if you want to get the real taste of it, go for the bocata de calamares! Los Bocadillos is based in the lively and non-touristic district of Moncloa, in the North West of the city. This is a great place to enjoy a traditional and huge bocata de calamares whilst hearing the waiter shouting out each tapa that has been ordered. It was founded in 1940 and its speciality is the bocata de calamares –Important: Don’t forget to order a cold beer to accompany it. Casa Rúa is probably one of the cheapest and smallest bars right off the Plaza Mayor. Don’t be surprised if you see people pushing into each other in order to place their orders. Based between Plaza Mayor and Puerta del Sol, Sol Mayor is one of those places that let travellers find the true spirit of Madrid. Here the counter is always full of tapas to choose from, such as the classic sandwich of fried squid, patatas bravas or chopito portions (fried cuttlefish) – Remember here the menu is all about fried snacks! Very close to La Ideal, La Campana invites travellers to taste very cold cañas whilst enjoying a truly Spanish atmosphere. Get a tapa and a beer for only 4,50 euros. If you are travelling to Madrid this summer and you need accommodation check out hotels near Lavapiés, one of the most cosmopolitan areas in the city with bars and restaurants that open until late. For metropolitan transport information, visit the metro website. Remember this is the easiest way to move around the city and if you are thinking to stay there for few days, get the 10 rides pass. For more interesting bar suggestions in the Spanish capital, check out Cheap in Madrid’s Food & Drink section. Enjoy Madrid and don’t leave without checking out these 10 bars for the best bocatas de calamares in Madrid. Marta López is a Spanish travel writer based in London. She loves travelling, discovering new cultures and Mediterranean cuisine. She dreams of moving to Madrid one day. She writes and contributes on the blog of Expedia in the UK.